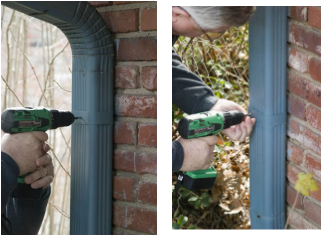 The Garden Water Saver downspout redirector is an excellent choice in that it attaches inline between joints of your spout and once your rain barrel is full, water is automatically directed back out through the original spout. It does require a small amount of cutting with tin snips in order to fit properly. Unfortunately, our downspout in this example is too large to use the Garden Watersaver.